Good morning and thank you for stopping by today. Here is a cute beach themed frame. I covered the frame in DCWV Surf's Up Stack and mod podge. I then used my Cricut to cut out the cute little sunglasses and umbrella. I used some glossy accents on the glass part of the sunglasses. The sentiment and banner is from My Creative Time Just Simply Live alphabet stamps. 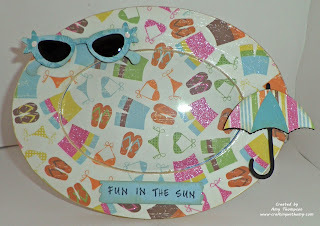 I used pop dots on the umbrella, sunglasses, and banner. I hope you enjoyed my frame. 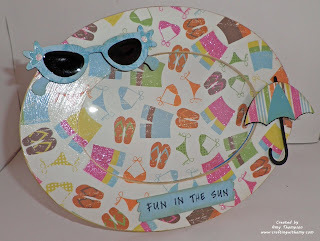 Please check out this weeks Fantabulous Cricut Challenge here. Also make sure to check out the FCCB Vinyl University here. Super cute Amy! LOVE the paper and your images are perfect! Fabulous job! So cute! Awesome idea to cover a frame. This is great Amy, I love the paper and images you chose!! A great frame for summer memories. Great idea! Love the paper and the cuts you used-great job! This is a great idea! It turned out super cute! !